50s retro halterneck China Rose Pink swing dress. 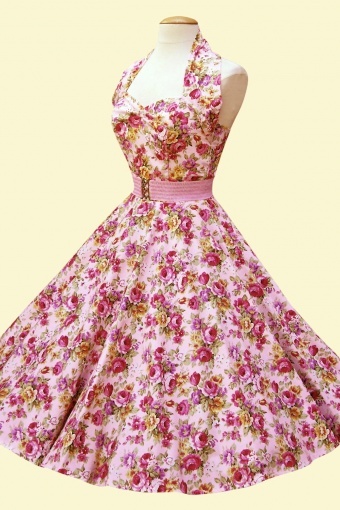 This wonderful 1950s halterneck dress is made of a romantic soft pink rose print. They are perfect for that special occasion be it for bridesmaids, proms or just that romantic picnic. They fly out the door. Is it any surprise. Can you really beat their beautiful Retro 1950s Vintage style. We just can't make them fast enough. This dress is amazing the bodices are boned and lined to give you that great pin-up bullet shape. It lifts your bust while nipping in your waist to accentuate those curves. Back zipper. You can look the bell of the ball or the wonder at any wedding in this beautifully flattering style. The listing is for the dress alone, luxurious petticoats are available!